Parry & Pfau’s video has seven shades of laughter, a stunt double, animal actors, a Morgan-Freeman soundalike voiceover, elf jokes, a clumsy Christmas tree, and lots of holiday cheer. But some people still vote for the same old boring holiday card every year. Those same people probably also like being in an elevator full of people who use cheap soap, dipping tortilla chips in salsa mass-produced in New York City, and eating peanut-butter sandwiches without milk. But for everyone else, there’s Parry & Pfau’s Christmas video card. 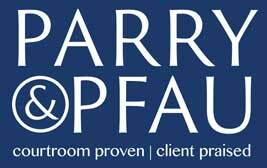 Parry & Pfau 2017 Christmas Video: "It's a Wonderful Law Firm"
Every year our firm does a Christmas video. This is our fourth year in a row, and we chose to do a mash-up between It's a Wonderful Life and Terminator, and we answer the question, "What if Parry & Pfau didn't exist?" Congrats to Benjamin Brossett, whose video entry won him the 2017 Parry & Pfau Left-Handed Scholarship for $1,500. Check out his winning video as well as some other great videos. Our annual Christmas video is now available!